Once a consumer starts researching products on their smartphone, the actual purchase of a product is pretty closely behind. There are a wide range of items that people are shopping for on phones. 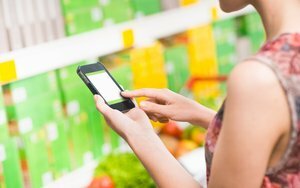 Consumers in Japan and China use phones for grocery shopping way ahead of other countries. In China, 88% of consumers use phones for grocery shopping and 63% of consumers in Japan. After they start their mobile research, more than half (54%) of U.S. consumers end up making the purchase in a physical store. In China and the U.K., more consumers make their final purchase via mobile rather than in person or via desktop. Shoppers in the U.S. may pass on mobile payments and prefer to make most of their purchases in a physical store, but that doesn’t leave mobile out of the process. 11 comments about "Mobile Research Starts The Purchase Cycle; 78% Buy Within The Day". Ed Papazian from Media Dynamics Inc, October 26, 2016 at 11:10 a.m.
Give me a break. The wording suggests that these incredibly high percentages apply just about everytime a consumer is exposed to an ad on a smartphone, when, it all probablilty, the question asked was something like this , "Have you ever ( or "recently" ) made a purchase just after seeing a mobile ad? "This kind of research is blatent propaganda and assumes that advertisers and agencies are gullable idiots. Sure, a certain, but small and unknown, amount of immediate purchase is generated shortly after a mobile ad is seen and this might be a modest plus for advertisers peddling impulse buying products, particularly when the "audience" is near a store or is willing to pause and make a buy online. But to imply that this happens most or almost all of the time, no matter what product the ad is for, is silly. Chuck Martin from Chuck Martin replied, October 26, 2016 at 11:20 a.m. The smartphone activity typically is research looking at and for products, Ed, not to do with mobile ads. Ed Papazian from Media Dynamics Inc, October 26, 2016 at 1:35 p.m.
Chuck, whether it's doing research or actually making a buy, I believe that the data presented in this manner is intended to imply that you---the advertiser---get nearly instant action just about every time you show an ad to a consumer via mobile. That's true, sometimes but not most, let alone al,l of the time. It's just a promotional exageration. Chuck Martin from Chuck Martin replied, October 26, 2016 at 1:45 p.m.
That may be a by-product, but the study had nothing in it regarding mobile advertising Ed. It also is consistent with other research on mobile shopping patterns. Doug Garnett from Protonik, LLC, October 26, 2016 at 4:54 p.m. I think the problem here, Ed, is that this appears to be self reported. And we have decades of experience that consumers are horrendous at giving accurate reports of the behavior that led them to purchase. My guess is that cell phones are their mental fall back for what they did - that stock answer to give the researcher something to write down. What really happened? If I'm right, we certainly won't find it out here. And we can be certain it's far far different from what's reported in the research summary. Doug Garnett from Protonik, LLC replied, October 26, 2016 at 4:58 p.m.
Net out: Its a study I recommend we ignore. Ed Papazian from Media Dynamics Inc, October 26, 2016 at 5:40 p.m.
Thjanks, Doug for those comments. My issue with this kind of research, aside from technical reservations about response reliability, etc. is the implication that the findings apply---on average---to every set of ad exposures. Imagine the way it would work. The millennial is happily walking down a street chatting away on his/her smartphone, when an ad appears. Suddenly---within minutes?---this causes the smartphone user to stop the call in order to research the advertiser's ad, go to its website and/or make a purchase. Meanwhile another ad appears, then another, and another and almost every time, these ad exposures trigger some sort of response. Tha's a nightmare scenario. People don't operate in such a disjointed manner and ads aren't that effective at stimulating a response. Also, with so much disruption using smartphones--prompted by knee-jerk reactions to so many ads---I suspect that most users would either go nuts or, if they wanted to continue using their devices for their own personal use, they would stampede to install ad blockers. Doug Garnett from Protonik, LLC replied, October 26, 2016 at 5:55 p.m. Thoroughly agree with your points, as well. Having started my career in tech, I think a part of the problem we have is that tech folks, even tech marketing folks quite often, have a far better sense of tech than of human nature. And the true chaos and fun of consumer lives frustrates them rather than enlightens them. Those are broad suggestions and there are clearly exceptions. But I spent my 10 years inside the geekiest of tech, did human-computer interaction work, then evolved my way out through sales then marketing. And have continued to work with many tech companies. It's a struggle for any company in tech to develop a healthy sense of truly human behavior. John Grono from GAP Research replied, October 29, 2016 at 11:12 p.m.
Doug, does that mean or imply that the survey of 2,000 wasn drawn from Nielsen's 6,000 panel? I'm confused. Here in Australia,our National Privacy Principles would make that illegal. Jeremy Geiger from Foursquare, October 30, 2016 at 4:36 a.m.
1. Gap between info/content available online vs. in-store. Ex: From my limited experiences, info from Associates in-store in China is limited. 2. Mobile penetration & Screen size. I believe Japan has the highest ratio of phones to population. Also bigger screens lead to easier shopping research experience. 4. Online prices, delivery fee & shipping days. Most of the things I buy here in China are $0-1 delivery fee and arrive in 1-2 days. 5. Rural vs. Urban population & car ownership/usage. The US's high car usage rate may be a factor in maintaining higher in-store rates. In a remote village, eCommerce will have great convenience. 8. Materialism & sustainability concerns. Japanese typically seek high quality products that will last (perhaps 1 factor in their longer 'consideration' phase). Societies with more disposable consumerism would be less concerned about quality and more likely to buy online sight-unseen. 9. Types of products being purchased. Considered purchases (generally more expensive product categories) are more likely to be bought online than impulse product categories (like fast-moving CPG). Richer countries would be buying more bigger purchases. 10. Brand consciousness/importance. Nielsen has reported that Asia-Pacific is the most brand conscious region in the world and that consumers in China and Japan are happy to pay a premium for specific brands and products. Could favor the "infinite aisle" that exists online. Chuck Martin from Chuck Martin replied, October 30, 2016 at 10:15 a.m. Thanks, Jeremy all very good points, as usual (what are you doing in China? Email me). The markets really are different, though all mostly marching in the same mobile direction.